Those with an IQ above 200 are called "unmeasurable genius". Along with a good intelligence quotient, emotional intelligence, a person's personality, etc., play an important role in a person's overall success. The Guinness Book of World Records discontinued the "Highest IQ" category in 1990, after concluding that IQ tests were not a reliable measure of intelligence or enough to designate any one person as the world record holder in the category. Measuring and establishing intelligence by the means of certain tests has always raised several questions. Are such tests reliable? Why aren't those with very high IQs developing flying cars yet? Why haven't they contributed more to this world? It's simple. Intelligence is a very subjective trait, and while IQ tests can establish a certain level of smartness, they cannot identify any single person as the smartest or most intelligent. Several tests with different scales have been established over the years, with different standardizations and deviations. And the names of the people mentioned here have taken different tests, the data of which is not available for some. Because there is no exact measure and the established figures have been achieved via different tests that may not have similar ground, it is difficult to establish what the "highest" score is. Here, however, we provide you IQ scores of some individuals who are known to have the highest. At the age of 2, Terence was quite familiar with basic arithmetic. At the age of 13, Terence Tao was the youngest gold medalist in the International Mathematical Olympiad. By the age of 20, he received his Ph.D. from Princeton University. At 24, he was made a full professor at the University of California, Los Angeles, and was the youngest individual ever to hold that position in the university. Christopher Hirata was the youngest American to win a gold medal at the International Physics Olympiad. He did not go to middle school, and by age 14 he entered Caltech (California Institute of Technology). At the age of 16, he was part of a team at NASA that was working on projects that dealt with colonizing Mars. By age 22, he received his Ph.D. in Astrophysics from Princeton University. 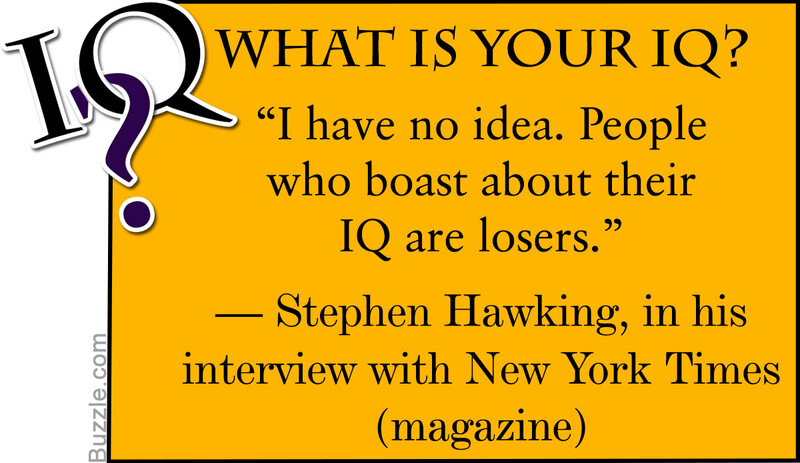 He was listed in the Guinness Book of World Records under the category "Highest IQ", for receiving a score of 210. By 3 years of age, he could read Korean, German, Japanese and English, and at 6 years of age, he solved a calculus problem on television. At the age of 7, Kim was invited to NASA by the United States, where he did several research studies. He eventually completed his Ph.D. in Physics in the United States by the age of 16. Marilyn had an IQ score of 228 (Stanford-Binet test) at the age of 10, though this figure is highly disputed because of the calculation methods of the test. In 1986, Marilyn was listed in the Guinness Book of World Records under "Highest IQ (Women)", after Guinness accepted her adult IQ score of 190, and held this position for 5 consecutive years. She was inducted into the Guinness Book of World Records Hall of Fame in 1988. A person's intelligence quotient can be understood based on the result s/he receives after performing a legitimate IQ test. Depending on the category those scores fall in, a person is declared to be intellectually gifted, superior, etc. A person with a very high IQ score tends to fall in the 'gifted' category. This means a person whose IQ ranges above 115 is considered gifted. In fact, there are various degrees of giftedness, which have been explained in the table below. The argument regarding a person's ability to perform well in IQ tests is attributed to both 'nature and nurture'. This means, while heredity does play an important role in defining a person's intelligence quotient, it is also the environment that has an influence and that is capable of nurturing this ability. This includes a person's nutrition, the education received, the family environment, and the general motivation to seek more information than others. Furthermore, culture, race, and gender also play a role in determining a person's IQ, with no bias towards any race, culture or gender. Recent trends have shown that the normal IQ score is increasing every decade as a result of the rapid changes in the world we live in. The high competitiveness, the concern towards overall health and nutrition, and the way in which information is now so easily available helps in this regard. This entire trend is described as the Flynn Effect. An important point to remember is that even the highest IQ score can only give a person the crown in the field of academic intelligence and problem-solving. In some cases, a person may have all these attributes and may be considered truly gifted. On the other hand, an intellectually gifted person may not be gifted with these other attributes. Simply put, a high IQ score cannot be held solely responsible for a person's success in life; a balance with some of the qualities mentioned above are equally essential.